Oh, it is also almost pea season at our U Pick farm, I am really excited about making farm fresh baby peas too! You've seen this photo before, I was playing with picnik. This is the auto corrected color. I need to apply that one more often. I keep looking at this next to the original scanned version - it is neat to see the differences. BTW The 6 month old guy has his next well baby appointment tomorrow & gets to try carrots today since we finished his squash yesterday. I hope he continues to enjoy all of the food that we offer, because turnips & rutabegas are up next! I read in a book to start with root vegetables as they are sweet, without being fruity sweet. So far I am steaming & pureeing them by hand. 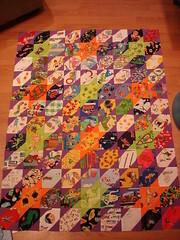 On the quilty front, I am cutting for a large I SPY - complete with a scrappy back. 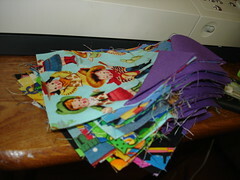 Kind of unfortunately, at the same time i am sorting & cutting for several other I SPY's - it is a sickness I tell ya. Do you think I have a "thing" for I SPY's? 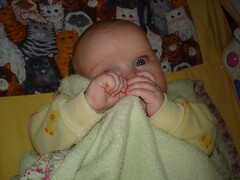 The plaid blanket was mine as a baby. 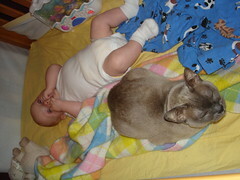 The blue cat receiving blanket/burpcloth/drool catcher, started out under nicely folded under Jacob's head... He has grabbibng figured out... He also turns a lot in the crib. But he seems to like the blankets/quilts even when he is wearing a blanket outfit - yes, they have outfits that are blankets - Jacob has 2 of them. 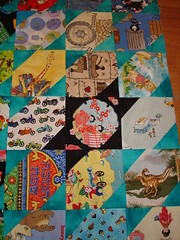 What do I see, a border that makes me want to see the whole quilt. Well, that is what I thought, but it was actually a "table runner" for the foot of your bed. Is that cheating? Would any of you consider making one? The same magazine gave me a pretty good idea on how to use my Liberty collection... & It had anpther quilt that is right up my alley - simple straighforward & scrappy! With that said, Shavout, the anniversary of the revelation at Sinai and of the gift of Torah to Israel, is the next holiday in the Jewish Calendar. The Torah itself is compared to milk -- "Honey and milk under your tongue" - and thus dairy products are symbolic of that great day of Sinai. So I need to start thinking about a dairy meal. So I am calling out to all of you cooks, send me your cheesy goodness! No meat for this holiday, just cheese, glorious cheese! This would be my world famous dairy kugle, a needle casserole. Note: You can also make the kugel the day before, bake only for 1 and 1/2 at 350, and before serving cook it an additional 30 minutes. Mr. 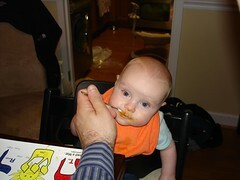 I've got an ear infection, :o( is eating pureed squash - his first real food! He likes it, Jacob really likes it! I love how that blanket is all tucked in. This was the first time that Jacob reached for that bunny. 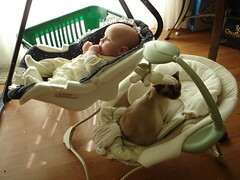 He likes the seat, it vibrates as well as plays music. 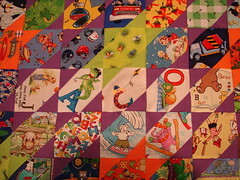 We used the quilt at the Doctor's office this morning - it is breezy & cool in Maryland this morning. Jacob is doing fine, the doctor is -pleased with is progress. 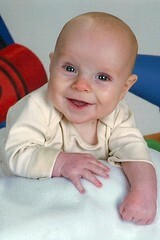 25 inches, 15 1/2 lbs., we have our 6 month check-up next Thursday, for the official record in the baby book numbers. Watch out pureed food, here we come! 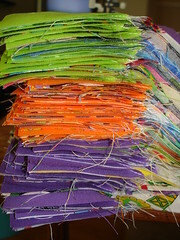 I have been cutting the selvages off of most of my fabrics (BIG FAT LIE - I am not taking out all of my fabrics...), So I have been cutting the selvages off of a bunch of my fabrics. I, by the way, still have way to much fabric. 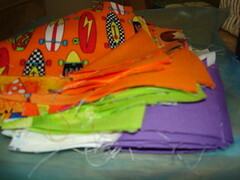 I am probably going to have a grab bag of fabrics to give away eventually. 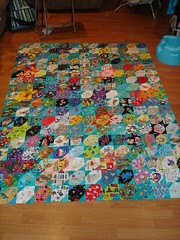 I have been cutting for 2 I SPY quilts, one will be queen or king size, needing about 525 charms... 21 x 25 layout. 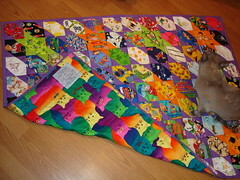 (95 inches x 113 inches) I have about 350, but I have some that I have you to cut as well... No they are not all cats. That is the other one that I am cutting out. It is inevitable, whenever I am cutting/sorting, I end up with a cat pile. 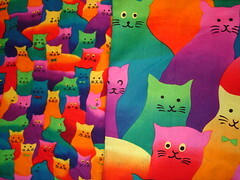 I have not counted the cat pile, but I am going to make a twin sized quilt with them. Only this time, the cats have to be doing something, wearing something, with something, or on something - not just cats for cat sake - unless they are already in the pile. My rules are flexible. 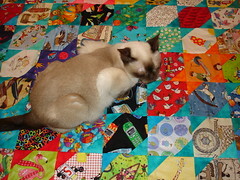 I am also cutting about 99 10.5 inch squares for a "Bonnie back." Those are my larger novelties, so that a whole scene can be sceen instead of just a portion of the scene, as in the case when they are used on the front, although I am trying not to use them on the front if they are on the back, but I may have to become more flexible there as I need about 175 more charms right now. Jacob uses cloth diapers, so I am only buying disposeable for this trip - I am shipping them, so that I don't have to lug/pack them. Otherwise, I would be shopping on the other end. Which BTW is a great idea. I am ready to talk about packing. 1. we are shipping a box to the hotel. 2. we want to minimize the checked baggage. Do you pack a lunch/dinner or buy from the airlines if not much in the airport? Have you traveled by airplane with a baby? What did you bring? 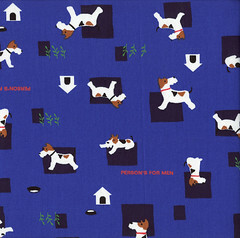 I am mentioneing this because I need to press some yardage - not fun using the press & cut (Or is that cut & press?). I must mention that I have an over the door ironing board, but I don't like it & rarely use it. Oh well, at least my mini-group is meeting this weekend, I can ise that big board without guilt. Here I come with far too many yards that need to be pressed! The quote on the fabric is too funny! Do you see the special treat? The backing will be these gargantuan kitties (the one on the right)! The ones on the left are the "normal" sized kitties. 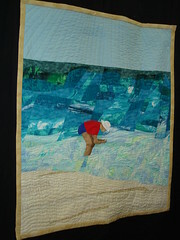 I found the huge ones at a "quilter's yard sale" several years ago - I snatched them up lickety split! Since Debby is showing her I SPY, I'll share my I SPY in progress. Do you see any stars? A not orange (or lime) I SPY with the purple. No, he is not feeding himself yet, he only thinks he can. This all means that we will arrive in Bend a little later, but that is o.k., I had only planned on visiting the High Desert Museum & missing out on that is o.k. in the grans scheme of things. Thanks again for the awesome idea Cher! I have to start by saying, I love where I am in my life, but that it wasn't always this happy. Mother's Day in particular was a rough day during those years when I wanted desperately to be a mother, but just couldn't get biology to agree with me. What a slap-in-the-face reminder of my monthly struggle and monthly disappointment. But there are the less fortunate ones: the couples whose infertility is chalked up to "unknown causes" and who just can't manage to get pregnant, despite all of modern medicine's advances. And the ones who seem to be able to get pregnant, but experience recurrent loss. Their syndromes aren't life-threatening, but come with their own special brand of pain and grief. I know many people in these situations, and though they hide their heartbreak from most, I see it and I understand it. If this all seems too heavy on such a special day, forgive me. I only endeavor to remind mothers of how lucky they are, how special their maternal roles are, and how miraculous this whole procreation thing really is. 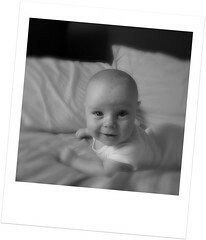 And I also offer a little advice: please don't ask your childless friends when they're going to have a baby. How do you know they haven't been struggling to do so for years? And if you do know someone struggling with infertility, please be an ear to listen and a shoulder to cry on, but please DO NOT offer unsolicited advice in the vein of "If it's meant to be, it will happen," or "Maybe God doesn't want you to be a parent," or "Maybe if you just relax, you'll get pregnant." Believe me, having been there, these are the types of statements that make us want to choke you fertile creatures. I hope your day was lovely, we had a low-key day & that was a-o.k. On our walk. Jacob was looking at the creek rushing under the bridge! I hope that you all have a Happy Mother's Day. Aside from Friday night, we will be staying in (near) Portland. Two people have suggested going out to Cannon Beach. Since Oregon is on the west coast (I am just so full of trivia, huh?) we'd be able to see the sun setting in the ocean. Oh so romantic... But the more pragmatic of the travelers is wary of my tendency to over stuff a "vacation." Arrive at the very end of Thursday. I really want to drive the scenic route to Multnomah falls - can i fit in the beach as well? Should I schedule some down time? Give me strength to not give in to what all the ‘other moms’ may or may not be doing with their children. 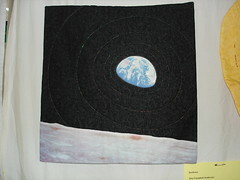 So now when look at this quilt , I can hear Alice saying, "I don't miss you one bit Ralph." Shooting star I Spy, twin size. 200+ different charms. A soon as I finished this one, I started a smaller version that I can take on the plane with us. not that Jacob will know what a giraffe is when I show him, but we will be able to chat about the images & quilts are just comforting! 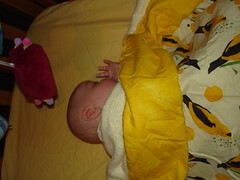 The baby can not longer reach his mobile... We moved the mattress down to the mid-level. I guess that officially means that he is getting bigger. That and the fact that he rolled all the way over from the front to the back! Is she a baby sitter or a bench warmer?